Considering Marion Station, Maryland, just up the road from Crisfield, is known as "the strawberry capital of the world", it's only fitting SIBC feature a cake worthy of such a legacy! 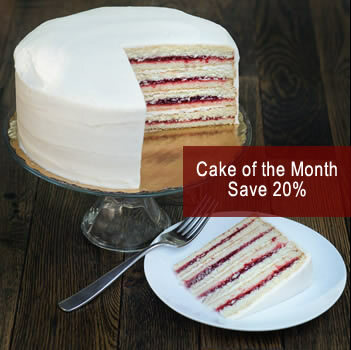 Featuring our moist, made from scratch yellow cake, a decadent strawberry filling, and our fabulous buttercream frosting, this cake is the perfect compliment to any gathering. The cake is approx. 9" in diameter, 3.5" tall, and yields 14-16 slices. Like all SIBC products, it is shipped frozen with dry ice in a recyclable cake box.